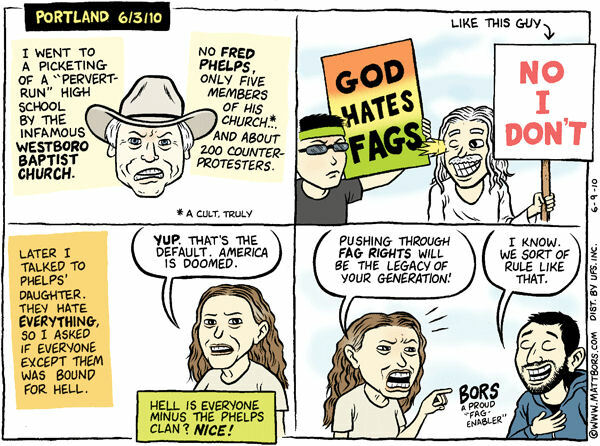 Once one of the most reviled sites on the web, the Westboro Baptist Church is now a tame shadow of its former self. I remember when you couldn't read a page there without being told a dozen times what it said in Leviticus about who you could lie down with. I am giving this site an Encouragement Award in the hope that they can lift their game and restore the site to its former glory. Come on, Fred, get in off the streets and back in front of the computer, fire up the rantomatic and give us some of that old-time gay bashing. Everybody needs somebody to hate, and we want you back. In 2004, this site did even better by being Highly Commended. This was achieved by the effort put in by Pastor Fred Phelps after the tsunami which devastated the countries around the Indian Ocean on December 26, 2004. Fred put the blame straight onto God. He issued two press releases, one headed "Thank God for Tsunami & 2,000 dead Swedes", and one headed "Thank God for Tsunami. Thank God for 3,000 dead Americans!". Here is Rev Fred on why God sent the tsunami. Remember that Phelps is a Christian. I sometimes find myself having a small chuckle at web sites which really should appal and offend me. The usual reason for this is that something is so outrageous that the site starts to look like parody. These sites are actually less dangerous than the ones which present bigotry or lies in a calm, dispassionate manner, but they often attract a lot of attention. Two examples floated past me this week, although both have been listed here for a long time. 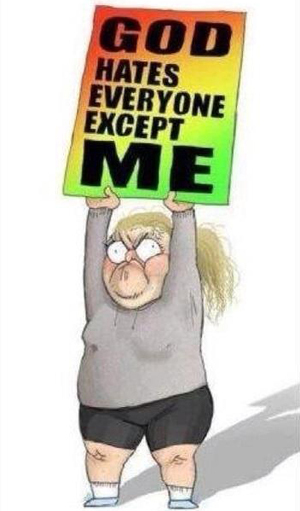 The first is the famous Westboro Baptist Church, better known as "God Hates Fags", owned by Fred Phelps. This site used to be a lot crazier than it is now, but it is still pretty badly unhinged. The second site is The Hal Turner Show owned, obviously, by mad radio announcer Hal Turner. While Fred is a single-issue hater and ranter, Hal is a bit more eclectic and adds racism to the religious bigotry and homophobia. (Hal seems to be having some trouble deciding whose side he is on in the Middle East at the moment. As he hates both Arabs and Jews, he doesn't know quite what to do about the Palestinians.) I'm not condoning or supporting what either Phelps or Turner has to say (although I will defend etc - Voltaire), but I think the attention and reaction they get is out of proportion to the harm they can cause. The ones we can laugh at are far less dangerous than the slick, reasonable sounding ones who politely spread hate on talk shows, in books and on the Internet. Then I turned on my television to see the awe-inspiring sight of the Reverend Fred Phelps sentencing all Australians to eternity in hell because one of us dared to act in a fictional work which contained scenes of homosexual activity. Fred has promised to picket Heath Ledger's funeral, but I have two messages for Fred: Perth is a long way from Topeka, and Australians might be a lot less tolerant of his idiocy than the folks at home.